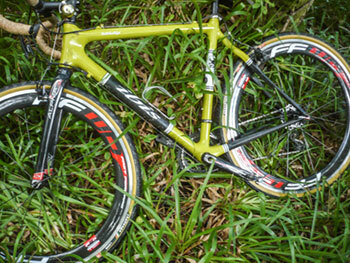 in its varied career, my ibis hakkalugi cyclocross bicycle has worn more than its fair share of wheels, mostly in the process of providing research and development for washingmachinepost reviews. naturally enough, these are of necessity, fit only for rim brakes; the ibis currently sports two sets of fsa carbon cantilevers, and though discs are reputedly set to tip the balance in the forthcoming season, i have based my philosophy on that expounded by richard sachs. 'if you've no grip in the mud, the type of brake is somewhat academic.'. or words to that effect. the most fabulous set it has worn, at least in the exotica stakes, was a pair built by jude gerace at sugar wheelworks in portland, oregon: highly polished white industries hubs laced three cross with original wheelsmith spokes (not to be confused with derek mclay's wheelsmith in larbert) onto a pair of ghisallo wood rims. trying to put into words just how different these are to your more common or garden alloy rims is amongst the hardest of tasks i have faced across the years, and though less than common nowadays, they are particularly fabulous. however, having fitted said wheels to the ibis, making sure to replace the rubber brake pads with cork (like carbon, wood does not conduct heat) i was somewhat fearful of totally wrecking components that more closely resembled cabinet-making than wheelbuilding. it's a fear that i voiced more than internally, only to receive an e-mail a day or two later from ric hjertberg, the american importer of said rims and the founder of the original wheelsmith. this e-mail simply said "check attached pic". this image was of charles pelissier shouldering a fixed wheel cyclocross bicycle in the process of winning the 1927 french cyclocross championship. 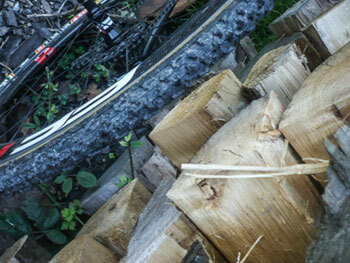 the bicycle was equipped with wood rims. the implication was well received. if wood rims were good enough for pelissier, there's very little i could ever do that would give them any more trouble than he could. 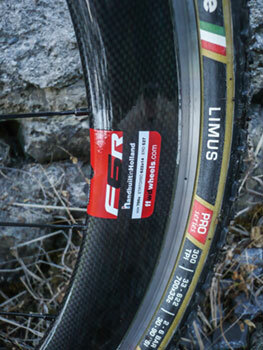 the same sense of foreboding resurfaced when a nice shiny pair of fast forward f6 deep carbon rimmed wheels arrived to fit the hakkalugi, along with the challenge limus tyres reviewed yesterday. with a 20 radially spoked front wheel, matched to 24 rear laced three-cross, their deep carbon rims bore such a high gloss clearcoat, that i feared for their safety while scrabbling through goodness knows what. though it would be common practice to swap out the standard brake pads for a carbon specific option, the f6 wheels obviate this necessity due to featuring an alloy braking surface. to my mind this makes them ideal for cyclocross as well as road-riding, for the notion of trying manfully to bring the bike to a sudden halt on a carbon braking surface in the gloopy wet, is not a prospect that a fearful amateur wants to consider. the phone call to paligap beginning "you'll laugh when i tell you..." is not one that i particularly wanted to make. there are three options available on the f6: the basic version (reviewed) features fast forward's own brand hubs, but they can also be purchased with either dt swiss dt240 or dt180 hubs for a more luxurious rolling option. the wheels arrive in a single, partitioned wheel bag along with front and rear skewers, rim tape and valve extensions, and that's where things became complicated. i feel i ought to point out that the complexity was partially of my own making due to not reading the instructions properly. or to be honest, from not having realised there were any instructions in the first place. with 56mm rims, even a 60mm valve stem is going to offer minimal pump contact, which is where those valve extensions enter the fray. silly me fitted standard 42mm valved inner-tubes with the intention leaving the presta valve open, then threading the extensions on through the rim holes. yet, try as i might, i could not gain any purchase. onto plan b: remove the valve from the valve hole, thread the extension then pop the combination back through the rim hole once more. except that extension still wouldn't fit. it transpires that the little plastic doohicky aupplied alongside the extensions is there to allow removal of the valve-core, replacing with the extender before replacing the core in the top of the extension. quite what the hapless owner is supposed to do if their valves do not have removable cores (michelin, for instance), i have no idea. in place of this faff, i simply left the valves open inside the rim, and took with me an extender that does screw onto the valves. 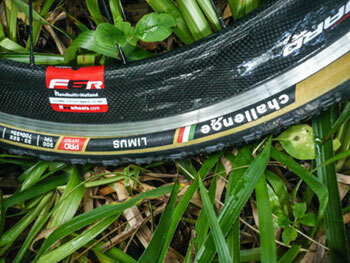 in the event of a puncture, the fast forward solution would surely lengthen the repair process? 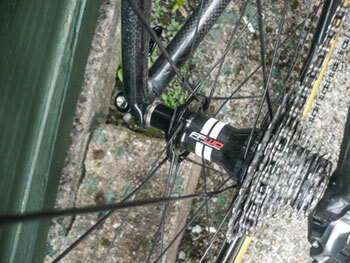 i really wasn't very kind to those shiny carbon rims. several years ago it was decided to create a footpath from the road end at caol ila all the way south to ballygrant, running parallel to the main road. most of us would expect a path that eschewed any dramatic uphills and downhills then surfaced with finely ground stone chips. what is in place is a particularly rugged track covered with sizeable stone chunks and frequented by sections of collapsed stone wall along the way. it's the ideal route to review wheels and tyres, but hardly the easiest method of walking to and from ballygrant village. that would presumably explain why i met no pedestrians at any point of the route. getting there was a simple case of riding the path through ballygrant woods and alongside ballygrant loch, before turning up at the lily loch and accessing the aforementioned path. not that i'm given to pessimism, but i fully expected to puncture on the sharp rocks that pass for the path's surface, and it seemed more than likely that the carbon's clearcoat would be scratched beyond redemption. despite any misgivings about having opted for the path rather than the main road (which would hardly have troubled tyres or wheels), the staying power of the fast forwards was particularly impressive. not only did they survive unscathed, their resilience in the face of adversity made navigating each twist and turn, uphill and downhill far more flattering to my scant abilities than ought to have been the case. however, even at my relatively slow speeds, i experienced the odd sideways swipe from the occasional wind gust. later in the year that would likely prove a tad more troublesome. other than a noisy freewheel (some are, some aren't), the wheels roll very well indeed, and even on remarkably steep but mercifully short offroad climbs, the rear wheel showed no tendency to pull sideways under pressure. 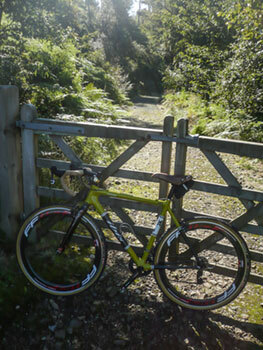 in a more standard cyclocross setting as espoused by my faux circuit in the woods, the straight line speed is most impressive, as is an aversion to being knocked from their line when clouted by chunky sections of undergrowth. i'm never too sure whether deep-rimmed wheels offer any particular advantage at the relatively slow, sheltered routes traversed in cyclocross circumstances, but i am quite impressed by anything that makes the bike look fast when it's not moving. they are somewhat stiffer than regular rims, particularly noticeable on one's posterior over rocky ground. however, i'd figure that's an acceptable trade-off when taking into consideration their excellent tracking properties and stability. 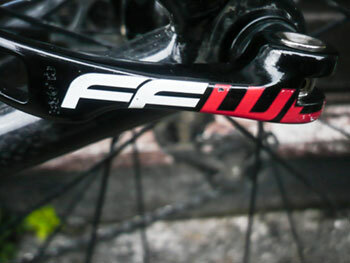 all told, the fast forward f6 wheels are not astoundingly light. 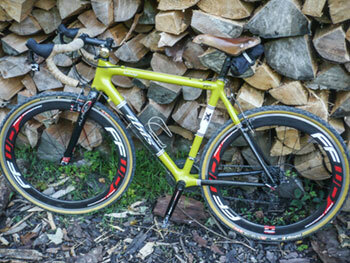 claimed weight is 1900 grams, though i would contend that they ride a bit lighter than such a weight would suggest. it's likely that the aluminium braking surface adds a bit to the carbon alone. 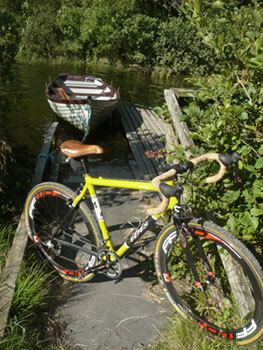 probably the only time you'd notice that weight is when carrying the bike over surfaces where pedals fear to tread; fine for us amateurs out playing in the woods on a saturday morning, but possibly a gram or two too far if you're intent on winning something. if time allows, i may swap them onto a road bike and see how they fare in the wide open countryside, particularly when gusting crosswinds come out to play, but as far as cyclocross is concerned, they're very impressive, much more so than i'd expected. they're also a lot tougher than i'd given them credit for, so initial fears over untoward damage appear to have been unfounded, particularly having ridden them in conditions that i've never seen in regular cyclocross. though gloopy mud was mostly conspicuous by its absence, it seems likely that the deep rims would fare better than regular low profile rims. henri pelissier would have wanted a pair. 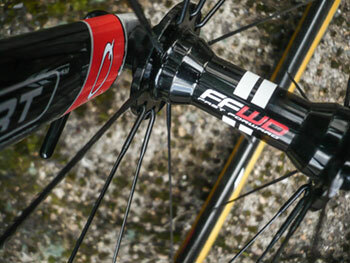 fast forward wheels are distributed in the uk by paligap. a pair of f6r wheels retail at £1060. though the review pair featured a shimano/sram pattern 11spd freehub (with spacer for ten-speed cassettes), there is also a camapagnolo version available.